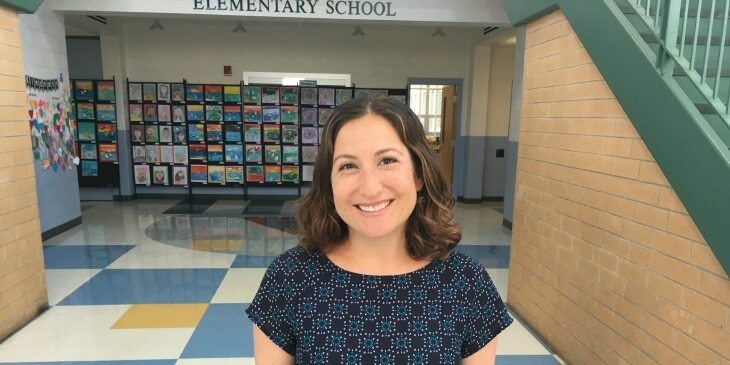 Mrs. Sarah Kanter has been the school counselor at Bells Mill Elementary School in Potomac, Maryland for 11 years and she has made it her mission to cut bullying off at the pass….before it starts. Mrs. Kanter developed her own framework that introduces and reinforces bullying prevention at crucial ages. For second graders at Bells Mill, Mrs. Kanter gives lessons on kindness, empathy and how to make good choices. Kids learn the difference between playful teasing and teasing that turns into bullying. Mrs. Kanter teaches a structured unit on bullying prevention and gives all of the second graders a book to read that focuses on how to deal with bullies. The kids jump into character and role play how to respond to bullying appropriately. For third graders Mrs. Kanter teaches a 5-part lesson on bullying that focuses on the child who bullies, the targeted student and the bystander. She has children experience each role and teaches them how to stand up to bullying, both as a target and a bystander. When bystanders intervene, bullying stops within 10 seconds 57% of the time (Hawkins, D. L., Pepler, D., and Craig, W. M. (2001). As a bystander, making a joke or taking the targeted student by the hand and walking away together can stop the child who is bullying in his or her tracks. For fourth graders, Mrs. Kanter conducts a unit on relational aggression. Relational aggression is defined as acts intended to harm others through deliberate manipulation of their social standing and relationships (Crick, 1995). Mrs. Kanter uses and highlights books, which focus on the power of words, social bullying and how to develop positive pro-social solutions. For fifth graders, Mrs. Kanter provides 2 to 3 lessons on social media, texting and cyberbullying. This unit helps pre-teens understand the impact of social media and the painful and sometimes long-term consequences of cyberbullying. Finally for all of the students starting in kindergarten, they learn to DEBUG. DEBUG stands for “Decide to Ignore,” “Exit, Move Away,” “Be Friendly,” “Use Firm Talk,” and “Get Adult Help.” Kids learn this acronym, so that they have steps to work through small, kid-sized problems on their own. School counselors can play an important role in preventing bullying. For more information, please see StopBullying.gov.